I have just received Sharpening Made Easy. The information in the book along with the EdgePro Apex has transformed my hunting knives, which I used to think were sharp, into razor edge fully functional cutting tools. More importantly, the now polished cutting edge hold for many hours of use, which is great. 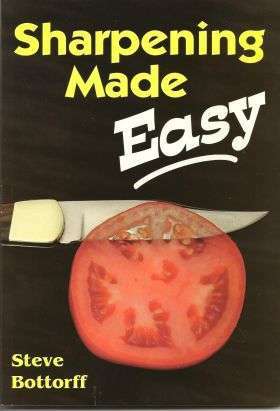 The book is well written it explains the subject in layman’s terms, which allows the reader to be able to sharpen a knife the way every knife should be sharpened. Well done for a great publication. I would recommend it to anyone. I bought your book back when I was dabbling with the thought of sharpening as a side business. Finally got up the nerve this past spring and I thoroughly enjoy it. Your book with techniques and insights is the bible of sharpening as far as I'm concerned. A copy of your fine book arrived a couple of weeks ago and I really like it! It makes the principles of sharpening easy to grasp, and it's full of useful references. Received your book yesterday and it was everything I was hoping it would be. I now have at least a basic understanding of what is required to truly sharpen a knife. The book also explained in technical terms why my Henckels 4-Star cutlery will sharpen using the steel but the edge is only good for about 30 minutes ... !! I've always been a flat stone user but I was blind to the basic principle that the bevel and the edge are NOT one and the same. knife sharpening equipment stand still for no man. Congratulations on your superlative work! (In addition to being a knife enthusiast, Dr. Neill has written his own bestseller "I'm Gonna Bury You!" based on his conversion from dishonest lawyer and convicted criminal to Christian minister. although I know it's all there. Hell, I've downloaded it all from there! degree of 'sharpness' that we want for a particular project. rec.food.cooking and tell THEM the very same thing! can easily be absorbed in an hour or two. welcome change from that old, tired, error-laden promotional book. book to be much less of a treatise on sharpening than a tease. do an able job of it, if anybody could. someone who is looking for a place to start to get really bogged down. to look for as well as specific recommendations for a few products. passed mine around to friends and it is very well received. (Cliff is a physicist and takes a thorough, scientific approach to knives. He used to publish testing and sharpening information on his website. Here is the payment for your book; because I promised to send it. However, I am very disappointed in your book! After reading all the allocades on your Internet site, was expecting an in-depth book on sharpening. This booklet does not even qualify as a book, as it is not over 100 pages. Secondly, the information is very general in scope, and really of little use to me. Reading your website prior to ordering was of much greater interest. It would appear to me, your booklet is just a come-on to sell people sharpening lessons. You don't even go into free-hand sharpening with machines - is it because you don't know how? If you ever write a real book, and actually explain how to sharpen things, let me know. In the meantime have fun spending the money I don't feel you earned. P.S. How many letters like this did you receive that were not on your Internet Site! NOTE: I am unable to duplicate Mr. Smith's double underlining of very and book in the first paragraph. Thank you for your letter and money order. I am sorry you were disappointed with Sharpening Made Easy. As I recall, you phoned to ask about the book, and I mailed it to you on the honor system. You said you liked the material on my website, and book sales is what makes the website possible. About the book's brevity: my publisher wanted a book that could sell for under $10, and the editor and I made it as lengthy as possible and still meet that goal. In comparison, the most important book on writing, Strunk and White's The Elements of Style, 3rd. edition, contains only 92 pages. Sharpening Made Easy is very broad in scope and therefore somewhat general, but it goes into great detail about what constitutes a sharp edge and the steps needed to get there. Much of the focus is on using guides and other aids, because I consider these to be the "training wheels" that get you started with good results. The lessons learned there transfer to freehand sharpening. The section on using paper wheels is about sharpening freehand, and illustrates how to estimate and hold the bevel angle. The section on sharpening with a guide shows how to use a marker to duplicate an existing bevel angle that can be applied to freehand sharpening. The sharpening school came about by popular demand two years after the book was published. It is almost impossible to teach freehand sharpening via a book, but we do develop from using guides to freehand in sharpening school. I do 80% of my sharpening business freehand. I hope this answers your concerns about what you failed to get from my book. Perhaps on a second reading you will get more. If not, please feel free to ask questions by e-mail, letter or phone.